With the DXair MC Series Modular configurations can satisfy your needs up to 200 tons with these large R-410A capacity units. The MC unit is available from 30 to 60 nominal tons in two-stage or four-stage compressor configurations. 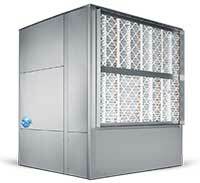 These highly efficient units not only will reduce your operating costs but play their part in reducing CO2 emissions. Our MC Series units with Bronze Glow technology have successfully passed the 10,000 hour salt spray test! Most companies do not achieve 10,000 hours on this test.